From Where I Stamp: Valentine Treats! 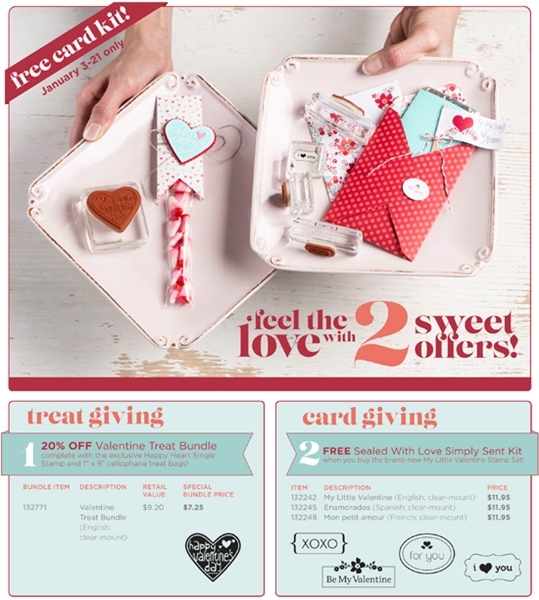 For a limited time only - 2 great Valentine's deals! Whether you want to send a sweet little treat or a beautiful cards to your Valentines this year, Stampin' Up! has 2 options available only until January 21, 2013! This bundle contains the brand-new exclusive Happy Valentine Heart Single Stamp and a package of 1" x 8" cellophane bags. Only available in clear mount and English. Get the Sealed with Love Simply Sent Kit FREE-a $9.95 value-when you purchase the brand-new My Little Valentine stamp set. This four-piece set was created exclusively for 2013 and will not be available again after January 21! View all these products on my online store where you can place your order today and have it shipped directly to you! Thank you for stopping by today! If you see something you like leave me a comment. I am a creative person with a passion to share my projects! Contact me to book your workshop. Thanks for stopping by my blog! All stamps, paper and inks used are © Stampin' Up! ® unless otherwise stated. All images and designs are copyright of Amanda Farlinger unless otherwise stated. This is a personal web site of Amanda Farlinger, an Independent Stampin' Up! Demonstrator, and I am responsible for its content. Stampin' Up! does not endorse the use of or contents of the classes, services, or non-Stampin' Up! products I may offer here.